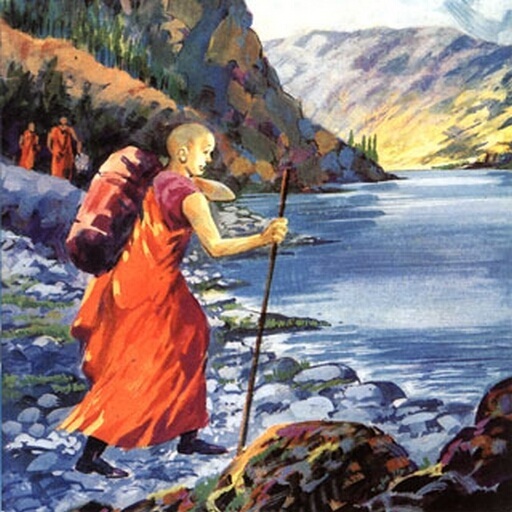 (The travellers) went on from this to the south-east for nine yojanas, and came to a small solitary rocky hill, at the head or end of which was an apartment of stone, facing the south,— the place where Buddha sat, when Sakra, Ruler of Devas, brought the deva-musician, Pancha-(sikha), to give pleasure to him by playing on his lute. Sakra then asked Buddha about forty-two subjects, tracing (the questions) out with his finger one by one on the rock. The prints of his tracing are still there; and here also there is a monastery. A yojana south-west from this place brought them to the village of Nala, where Sariputtra was born, and to which also he returned, and attained here his pari-nirvana. Over the spot (where his body was burned) there was built a tope, which is still in existence. Another yojana to the west brought them to New Rajagriha,— the new city which was built by king Ajatasatru. There were two monasteries in it. Three hundred paces outside the west gate, king Ajatasatru, having obtained one portion of the relics of Buddha, built (over them) a tope, high, large, grand, and beautiful. Leaving the city by the south gate, and proceeding south four le, one enters a valley, and comes to a circular space formed by five hills, which stand all round it, and have the appearance of the suburban wall of a city. Here was the old city of king Bimbisara; from east to west about five or six le, and from north to south seven or eight. It was here that Sariputtra and Maudgalyayana first saw Upasena; that the Nirgrantha made a pit of fire and poisoned the rice, and then invited Buddha (to eat with him); that king Ajatasatru made a black elephant intoxicated with liquor, wishing him to injure Buddha; and that at the north-east corner of the city in a (large) curving (space) Jivaka built a vihara in the garden of Ambapali, and invited Buddha with his 1250 disciples to it, that he might there make his offerings to support them. (These places) are still there as of old, but inside the city all is emptiness and desolation; no man dwells in it. In front of the cavern there are the places where the four Buddhas sat. There are caverns also of the Arhats, one where each sat and meditated, amounting to several hundred in all. At the place where in front of his rocky apartment Buddha was walking from east to west (in meditation), and Devadatta, from among the beetling cliffs on the north of the mountain, threw a rock across, and hurt Buddha’s toes, the rock is still there. The hall where Buddha preached his Law has been destroyed, and only the foundations of the brick walls remain. On this hill the peak is beautifully green, and rises grandly up; it is the highest of all the five hills. In the New City Fa-hien bought incense-(sticks), flowers, oil and lamps, and hired two bhikshus, long resident (at the place), to carry them (to the peak). When he himself got to it, he made his offerings with the flowers and incense, and lighted the lamps when the darkness began to come on. He felt melancholy, but restrained his tears and said, “Here Buddha delivered the Surangama (Sutra). I, Fa-hien, was born when I could not meet with Buddha; and now I only see the footprints which he has left, and the place where he lived, and nothing more.” With this, in front of the rock cavern, he chanted the Surangama Sutra, remained there over the night, and then returned towards the New City. Out from the old city, after walking over 300 paces, on the west of the road, (the travellers) found the Karanda Bamboo garden, where the (old) vihara is still in existence, with a company of monks, who keep (the ground about it) swept and watered. As they kept along the mountain on the south, and went west for 300 paces, they found a dwelling among the rocks, named the Pippala cave, in which Buddha regularly sat in meditation after taking his (midday) meal. Going on still to the west for five or six le, on the north of the hill, in the shade, they found the cavern called Srataparna, the place where, after the nirvana of Buddha, 500 Arhats collected the Sutras. When they brought the Sutras forth, three lofty seats had been prepared and grandly ornamented. Sariputtra occupied the one on the left, and Maudgalyayana that on the right. Of the number of five hundred one was wanting. Mahakasyapa was president (on the middle seat). Amanda was then outside the door, and could not get in. At the place there was (subsequently) raised a tope, which is still existing. Along (the sides of) the hill, there are also a very great many cells among the rocks, where the various Arhans sat and meditated. As you leave the old city on the north, and go down east for three le, there is the rock dwelling of Devadatta, and at a distance of fifty paces from it there is a large, square, black rock. Formerly there was a bhikshu, who, as he walked backwards and forwards upon it, thought with himself:—“This body is impermanent, a thing of bitterness and vanity, and which cannot be looked on as pure. I am weary of this body, and troubled by it as an evil.” With this he grasped a knife, and was about to kill himself. But he thought again:—“The World-honoured one laid down a prohibition against one’s killing himself.” Further it occurred to him:—“Yes, he did; but I now only wish to kill three poisonous thieves.” Immediately with the knife he cut his throat. With the first gash into the flesh he attained the state of a Srotapanna; when he had gone half through, he attained to be an Anagamin; and when he had cut right through, he was an Arhat, and attained to pari-nirvana; (and died).